For years, group members (in particular Sid Shapiro and Louise Olsen) talked of having a Torah of our own. 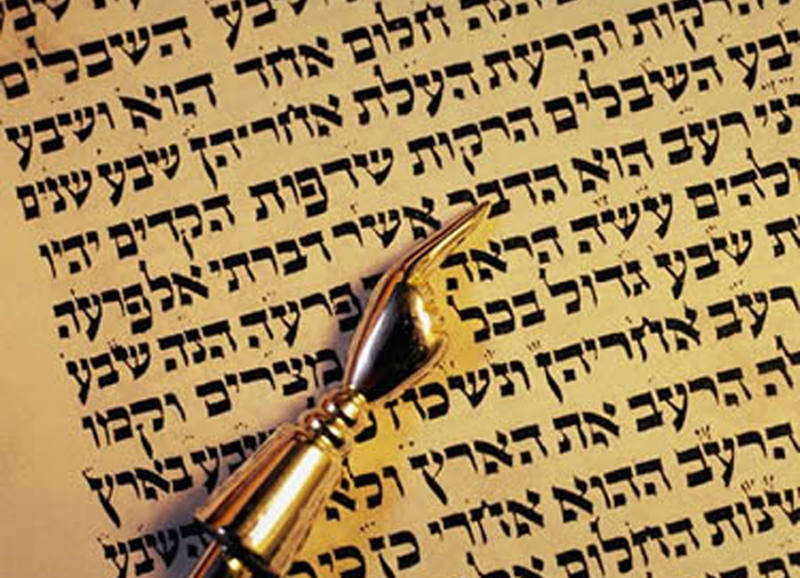 The Torah is the heart and soul of a congregation and the enduring symbol of thousands of years of Judaism. By chance (or some design), member Alan Berliner became friends with the archivist at the Seattle Holocaust Foundation and mentioned that we would be interested if he ever heard of a recovered holocaust Torah becoming available. A few months later, Alan received news that a former army chaplain (a rabbi living in New York) was seeking homes for several Torahs that had been used in military bases in Germany. They were liberated after the war and most were at least 70 years old. Soon all of the Havurah knew about this unique opportunity. Money was raised within days and Alan contacted the rabbi to make arrangements. There was one condition; that we have an ark. Zoe Mann was consulted and volunteered her ark for the Havurah. Weeks later, the precious Torah arrived. It may have been written in Poland in the 1920’s and it clearly was used by the U.S. military in Europe. It’s previous history is unknown. It was old and worn, but it was ours. Since then, over twenty young people have used our Torah for their Bar or Bat Mitzvah. In 2000, the Mann’s commissioned Island craftsman John Weinshel to build a permanent ark, which they gave to the Havurah. In subsequent years, Rabbi Fern Feldman held workshops on maintenance and repair of the Torah. 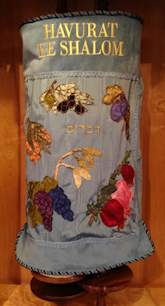 Recently, at a regular Friday night service led by Wendy Marcus, Pat Casey unveiled her exquisite hand sewing and embroidery work for a beautiful new Torah cover. Pat used a tiny chain stitch to outline each fruit, leaf, grape, olive and date. Not satisfied with her original work, Pat remade many appliques in the course of two years before bringing the cover to services.